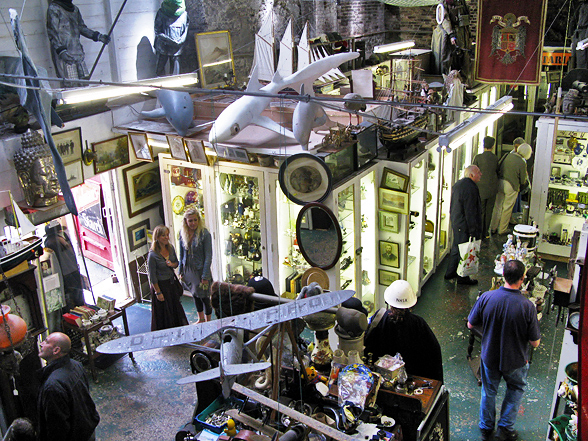 Parade Antiques and Curios Museum was founded in 1997, and has been trading on the Barbican, Plymouth’s historical harbour ever since. We are best known for having the largest selection of military antiques in the South West of England. In 2003 we moved to our current premises, a large 2400 square feet (260m2) 17th century warehouse, which houses over sixty display cabinets containing a massive collection of artwork, china, glass and ceramics, antique furniture, silver and jewellery, coins and medals, toys, film and TV memorabilia and much more! The shop also doubles as a “Curios Museum”, and houses items of significant historical interest, such as Charlie Chaplin’s first worn tramp suit, Hermann Göring’s Luftwaffe leaders uniform, the Duke of Wellingtons Funeral Banner and Joselito’s (“El Gallo”) Matador suit to name but a few. Also displayed are mannequins wearing uniforms from different nations and conflicts, huge sci-fi creations (such as our full size Dalek and Cyberman from “Dr Who”), wildlife models, and so much more it has to be seen to be believed! 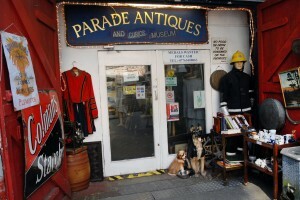 Check out the Parade Antiques own gallery to have a closer look.